Join the discussion on our forums! Come discuss Prince Malchezaar over in our dedicated Prince Malchezaar discussion topic. I always think am going to win when i saw someone put this card in the start of game lol, , getting your deck diluted is a bad idea. Why not? It's the best legendary you can have as a new player. I always found it surprising that they gave him such premium stats, ignoring the usual 5/5 standard. Possibly to out way the variance of his effect, though it still carries its own benefits. As it stands it's an objectively better Pit Fighter, which I find troubling. So I have kind of a story about this card. And how it led me to find my favourite legendary in the whole game (Hogger himself). So when I first picked up this game, the Randemonium brawl was in effect. That's a story for another time though. But basically, every card would be Hogger. But when I finished Karazhan, I got Malchezaar. Me, being kind of a noob, put it in every deck I could. Since "Moar legendaries=Moar gud". Almost every single time, there'd be a Hogger in my deck. So I'd play my Hogger, some times he'd win me the game, other times he'd lose it. But, he'd just keep showing up. It was a happy time, no matter what, I could rely on Hogger to come when I needed him. And while he most certainly wasn't the best legendary, he quickly grew to be my favourite. 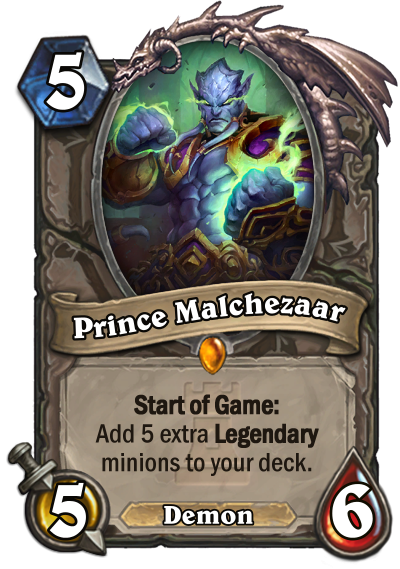 But yeah, that's the story of how Prince Malchezaar helped me discover my favourite legendary in the game. And while I don't need him to shove Hoggers into my deck anymore (since I crafted a golden one), I still run him in my Demonlock. Who knows? Maybe he'll win me another game. I swear you people are missing a chromosome. OP in Hunter, With Stitched Tracker - You can pick which legendary you want! This is going to be goodish also for all the year of the mammuth I think. Is it safe to assume that if you have golden, all five legends he pulls will be gold, too? Yes. Any card that is generated from a golden card will be gold too. Yep. I crafted a Prince Malchezaar in golden for 3200 dust. I have no regrets. does it will get the new quest legendarys?